PRODUCT DESCRIPTION: Unique Meal Moth trap which combines both male and female pheromones making it the only type that is able to capture both sexes of adult moths. This unique quality will have far bigger impact on local populations trying to mate and reproduce. Odorless and safe to use in any part of the home, these traps will provide an extra bit of protection when dealing with stubborn moth infestations that won't go away. Please note we also sell these parts of the kit separately (except the tie #2) once you purchase the kit you still may need extra female or male pheromones. 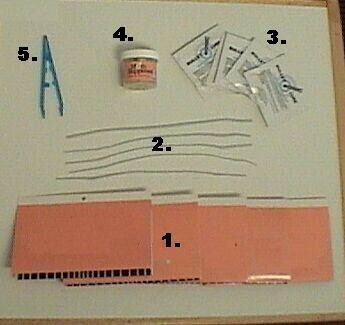 Suppressing kits are sold in kits which include 5 Traps (#1), 5 Tie-Ons (#2), 5 Male Pheromones (#3), 10 Female Pheromones (#4) and one pair of plastic tweezers (#5) used for handling pheromones. As a general rule, it isn't good to touch pheromones since you can contaminate them with oils or other scents. Most homes will need 2-3 traps set out and there is enough traps and pheromones to keep the traps active for at least 2 months. They may be used in conjunction with standard Moth traps and it is important to have them out at least 6 months for any infestation to insure all pupa hatch out and the local population has been eradicated. WHERE TO USE IT: In any part of the home. Ideally, any moth infestation can take advantage of this trap since it will capture both male and female adults. Mild to moderate moth problems may not need to have this trap used; the Standard Male Moth Trap may do the job. However, both can be used in the same structure at the same time and the added ability to capture females can lead to quicker eradication of any local infestation. 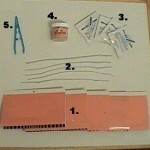 TRAP SETUP DIRECTIONS: Each Glue Trap needs a female "wick" set inside as well as a male "lure". Male lures will last 2-3 months but female "wicks" will only last 30-45 days which is why you get twice as many in the kit. BE SURE TO USE THE INCLUDED TWEEZERS FOR MOVING THE LURES ONTO THE GLUE PADS TO AVOID CONTAMINATION! RATE OF APPLICATION: 2-3 traps per 2000-3000 sq/ft of home. Best ever! This product works great!